Before the advent of the Seed line of designs, Wing 0 from Endless Waltz had been one of my favorite. The semi-useless wings are so stylish, they almost distract you from thinking “why the wings?” 🙂 The MG rendition of this cool mech is particularly nice. To be honest, I had the PG so I didn’t really care much for the MG version when it first came out, but over time I couldn’t resist the expandable gimmick in the wings. The expansion makes the wing looks more voluminous and complex, allowing more coolness. Some minor complaints about the kit is that the shoulder’s wouldn’t get vertical movements (which is probably hard to implement since the gatling guns are in the way), and the waist won’t bend backwards. Well it can bend forward for the classic shooting pose, but the pose in the pic above would be cooler if Wing 0 could bend backwards. This build has relatively little mods – I like the kit as is. Except for the wing’s support. The stupid joints connecting the main wings to the backpack’s “beams” are so ridiculously filmsy, there’s just no way it can support the weight. After some experimentation I replaced them by the excellent polycaps from Volks, which are very sturdy and holds up the wings very well. Also I learned something about V-color when painting this kit. For the very flexible, bendable wing tips, I used V-color since it is very stretchable; but at a certain thickness the thing just cracks. Yikes. So I had to strip and repaint again with a much thinner layer. One funny thing is that the kit is decal-mad – there’re some insanely verbose decals! I don’t know why people like those but I wish they’d just stop the yucky “race car” trend. Well I like the decal trend myself, but them Im an aircraft decal NUT and love to apply dozens to a model. Ive often thought that this these things were machines that needed to be serviced, they would need placarding. I actually use a lot of my aircraft decals on Gundam and MA.K models just to add that much more than the crap that comes in the kit. Looks good! I may have to get one! I hate the decal trend too; I always wonder why others think clean mecha with big decals and orange or purple scheme “realistic design”. Racing decals have no praticallity(sp?) on a mech, but I would understand more millitary like decals such as “warnings” and what not. Plus, for Wing Zero not being in any military service and only being used as a instrument of a rebel resistence; decals aren’t needed at all. But great work altogether, I’m envious of your skills. What kind of polycaps did you order from Volks to get the wings to stay in place? Do you happen to have a link? Thanks! I for one love the decals, one thing i would like to see you do is “hyper detail” the gun. One thing about gundam models i have noticed is the weapons (guns) never seem to come out looking real. Got this kit but having trouble holding the buster rifle with the hands, its not that they are loose or anything just the handle simply does not fit well, i know that you can use the small protrusions at the back of the rifle to hook onto the armour of the arms but i see that you dont need to do that looing at the first picture, anyone else have this problem and any solutions? This is absolutely brilliant…..love your work. 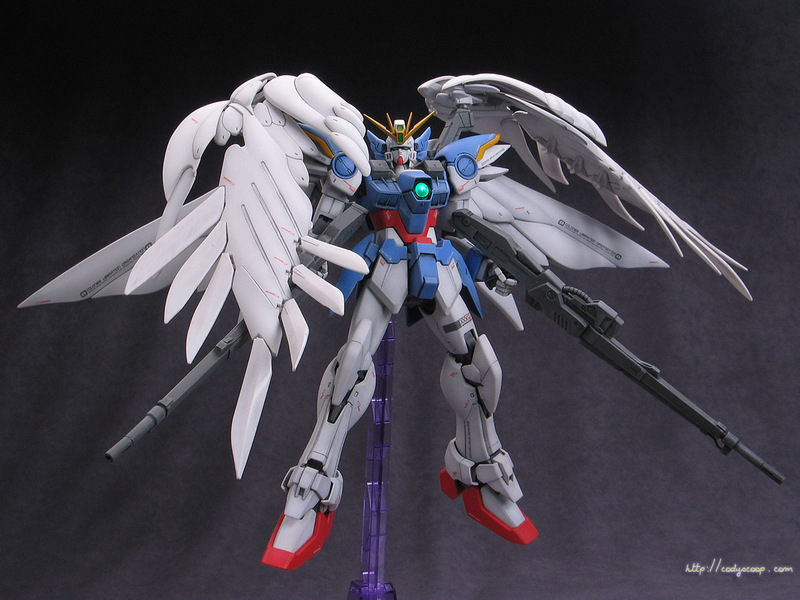 This is the best Gundam Wing I ever seen….!! Hello May you please tell me how I can customize a Gundam like you did. Your work is excellent, I like the wing structure, most impressive. I have a project I am working on and the wings you have would be cool. Is there a website that allows us to build our own custom Gundam by adding different pieces like you did. I would like to customize some really cool wings.